Setting the mood for any outdoor event, a tiki torch is a great way to make backyard barbecues, outdoor weddings or just casual drinks in the yard feel summery and festive. Tiki torches are fairly simple to use, and though there are a number of different styles available including solar powered and gaslight torches, the most popular variety are fuel or oil torches made of bamboo that act as temporary and reusable decorations. Some tiki torches are connected to a gas line and turn off and on with a simple switch. Solar-powered torches have a fake "flame" that lights up using energy gathered from the sun. 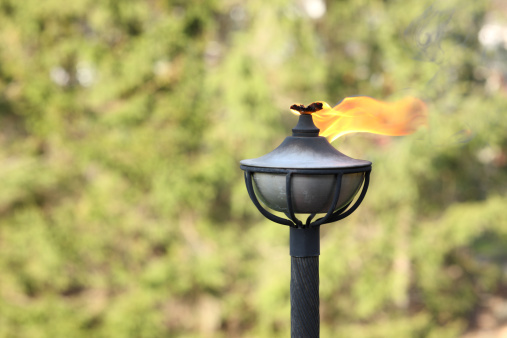 The most popular tiki torches are of the oil or fuel variety. These torches have a reservoir at the top of the torch that holds oil or fuel. The reservoir is filled and the torch is lit with a match or lighter. Most people stick them into the ground to offer light. If you do this, make sure the torches are forced a good six to eight inches into the ground to keep them upright. Pour the appropriate torch fuel into the torch receptacle over the wick directly from the bottle. Take special care not to get fuel on any other part of the torch or your skin or clothes. Tiki torch funnels or bulbs are sold at home goods stores and can help you fill the tiki torch easily with no mess. Be sure to immediately recap the fuel bottle to prevent spills. Once the fuel receptacle is filled, you can light the torch. It's preferable to use a butane lighter with a long stem to light the torch's wick so you don't risk burning your hands by getting them close to the flame the way you would with a match or a smaller lighter. When it comes time to put the tiki torch out, use the snuffer cap that comes with the torch. By dropping it over the tiki torch flame, the flame will be deprived of oxygen and it will go out. When the flame has died out, take the cap off so the wick can cool down and dry out. Once the wick has cooled, cover the torch with the snuffer cap. Leave any remaining fuel inside the torch while you store it for next use, but just be sure that the cap is on tight to prevent any spilling or leaking of the fuel. It's a good idea to store the torches away from any fire source or anywhere there might be an open flame. If you're concerned about the torches being accidentally lit when you aren't using them, dump out all of the fuel before storing.